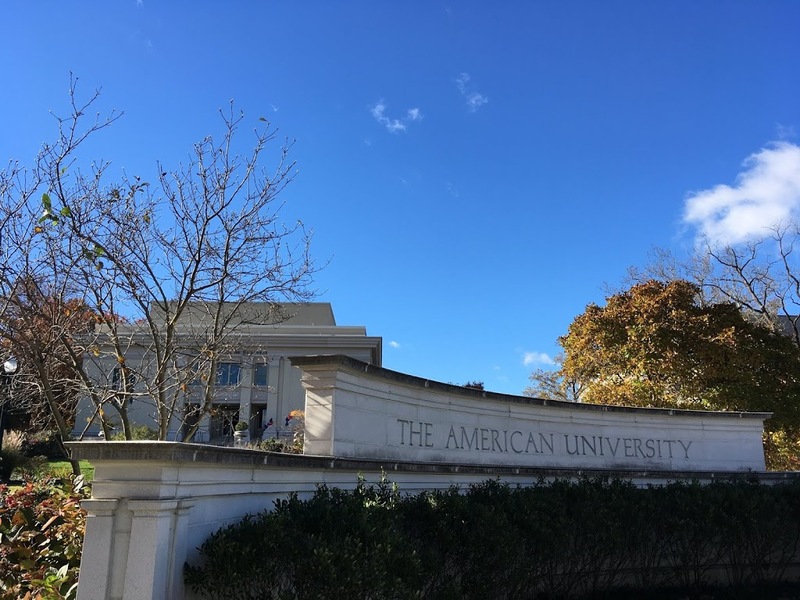 In early November I had the chance to visit American University. 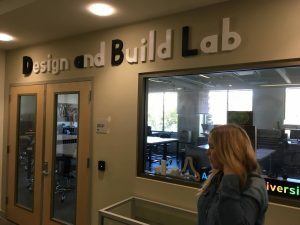 This was actually the second time I’ve toured American, the previous time being in the summer of 2007 (years before I started this blog), which makes this the first in this series that sees me revisiting a school. I’ve been recommending American to students for over a decade–would I still feel positively about the university the second time around? Read on! Size: Just over 8,100 undergraduates (approximately 35% men/ 65% women), with an additional 5,700+ graduate and law students also on campus. American is a very selective institution, having admitted about 5,500 of 18,700 applicants for a 29% acceptance rate. Students come from all 50 states and over 120 countries. 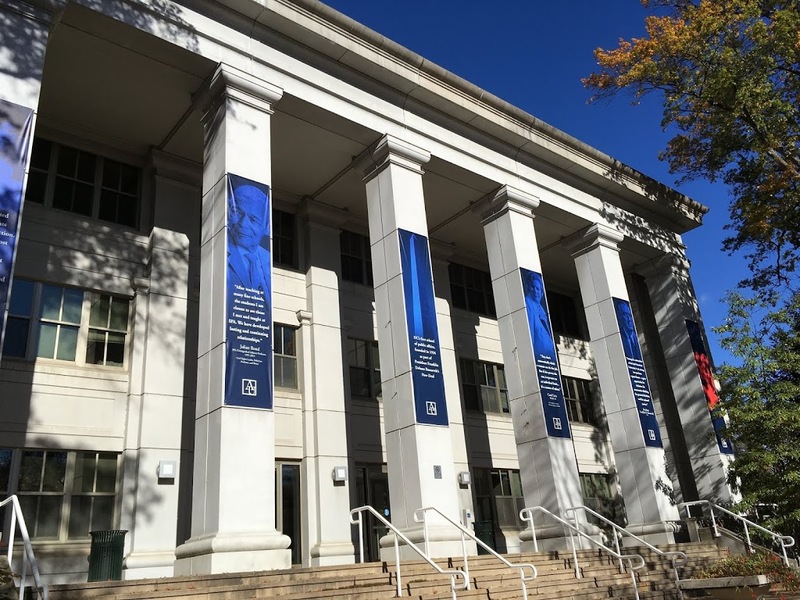 Programs of Study: 90 majors and minors with pre-professional programs in law and medicine; American is a liberal-arts institution which takes great advantage of its location in the nation’s capital to provide research, internship and job placement opportunities for its students. Sports: American has 14 NCAA Division I teams (8 women’s / 6 men’s). American also has 28 club sports (8 women’s / 8 men’s/ 10 co-ed) which compete inter-collegiately and numerous intramural athletic options. Campus Life: The admissions pamphlet lists over 200 clubs and organizations. On campus housing is guaranteed for the first two years (if application deadlines are met) with limited housing options for juniors and seniors. 70% of students study abroad (more than 7x the national average) and financial aid travels with the student. Costs & Aid: Tuition, room & board and fees total just about $65,048 (for “average room and board”–costs could be higher or lower depending on dorm/dining options). Parents need to fill out the FAFSA (Free Application for Federal Student Aid) and CSS Profile. 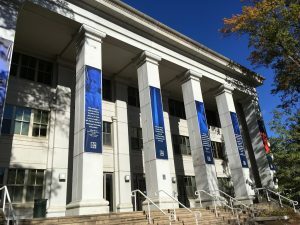 American boasts of bestowing over $90 million in aid and they guarantee to meet 100% of the need for admitted students who are American citizens or permanent residents. 30% of students receive merit aid. Deadlines: American University applicants can choose binding Early Decision, with a deadline of November 15 (notified by December 31), binding Early Decision II, with a deadline of January 15 (notified by February 15) or Regular Decision with a deadline of January 15 (notified by April 1). 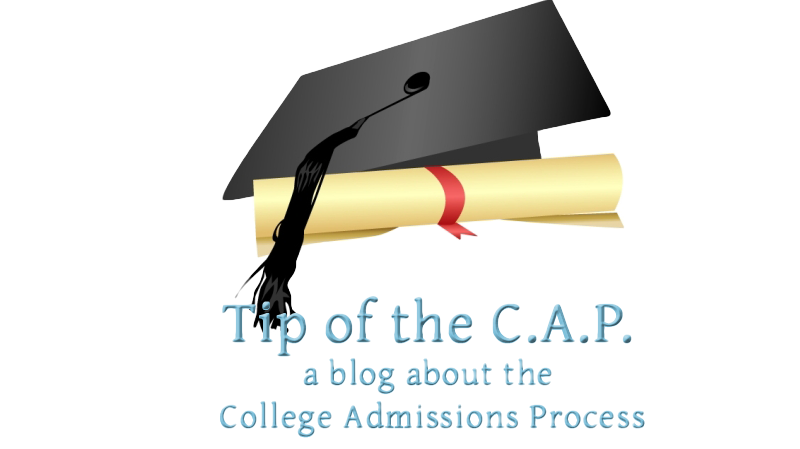 Students use the Common App or the Coalition App. The application fee is $70. Tests: American is test-optional; students (U.S. or international) do not need to submit ACT or SAT scores. Students who apply without standardized tests are fully considered for all available merit aid. Between 15-18% of applicants choose not to submit test scores. American University traces its history to the Gilded Age, when it was chartered by an act of Congress and was the only university within 200 miles of the nation’s capital that educated both men and women regardless of race. 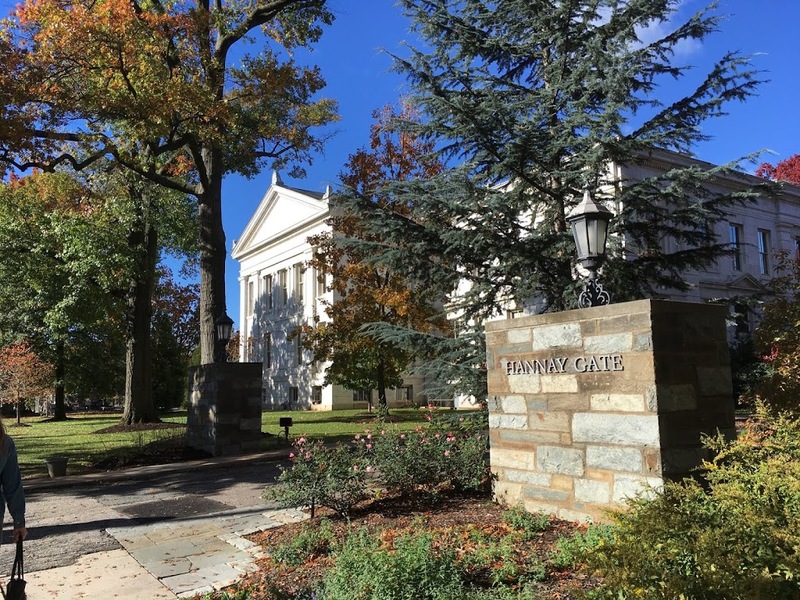 Today, American boasts a burgeoning campus in Northwest Washington D.C. (near the National Cathedral and Embassy Row). As I mentioned above, I visited American in 2007 and was struck at the time by the beauty of the 84-acre campus (all of which is classified as an arboretum), the easy walkability, and the advantages of being a discrete suburban campus in the midst of a world-class city (American is only four miles from the White House and is located on public transportations lines). I have a pretty good memory, and I was quite (pleasantly) surprised to see a very different (and bigger) campus than I recalled; according to the university’s Wikipedia page, several new academic buildings have been built in the last decade, and dormitory space has increased student housing by over 1,000 beds. When I visited this time the center of campus was dominated by a gigantic construction crane, part of a new Hall of Science that is currently under construction. Our tour also took me through the Technology and Innovation Building, which opened earlier in 2018. Many of the students I met (only some of whom were part of the admissions program) made deprecating remarks about AU’s continuous construction projects, but all were very proud of the new buildings and the resources that they provide. As is depressingly common nowadays, the tour did not take us into the library or a classroom, though we did walk through several of the key academic buildings. The tour did show a “typical” dorm room and common area; as a veteran of 19 years work in boarding schools this doesn’t do much for me–at some level, all dormitories are pretty much the same. But it’s clear that families appreciate the chance to see where their students will sleep. Other than wishing that we had been able to go into the student center, the library and the athletic center I thought that the tour was perfectly satisfactory. My guides, a junior and a freshman were attentive and engaged and clearly loved their university. Tyler (the junior) was constantly being waved at by other students on our walk. His partner, Scout was more of a beginner but did a good job. She also fielded a question about Advanced Placement by noting that AU will grant incoming students up to 30 AP credits; she entered with 19 and will be considered a junior at the end of this school year–pretty impressive! What did not impress me was the information session. The admissions office is now located on the second floor of the Katzen Arts Center (which Tyler proudly told us is longer than the Washington Monument is tall) and is a beautiful structure across Massachusetts Avenue from the heart of campus–I seem to think it was empty space in 2007, but I could be wrong. The session was without question the most inept I’ve ever seen. The presenter had some trouble with the technology in the room (she said it was a brand new presentation and that she hadn’t rehearsed it) which is understandable, but she also read the text of her presentation extremely quickly; she wouldn’t give John Moschitta a run for his money, but she was hard for me to follow–I can only imagine that visitors whose first language is English would have been left behind. Also, the format of the presentation involved her synchronizing her speech with a movie playing on screen, which I think is distracting. Finally, she was prone to malaprops (“our faculty are truly extinguished”, “legal studies, or the theology behind the law”, calling the FAFSA the FASFA) and referring to government agencies and consulting firms by acronyms rather than their full names. One other quibble is that she referred to how generous AU is to provide “free Metro access” to it’s students, noting that no other DC school does this. But it is clearly spelled out on the tuition and fees page that students pay $136/year for their Metro passes. That is a very good deal, but it certainly isn’t “free”. Of course this was probably just one presenter having a bad day, but if you are serious about American and/or do not speak English as your first language it might be a good idea to request a chance to speak face to face with the admissions officer on duty during your visit just to make sure that you leave having learned all that you need, and all that American University wants you to know. One thing that I liked about American in 2007 and is still true is that the main quadrangle is the heart of the campus, and the academic department headquarters are all there. Of course, this means that when class periods are over, several thousand students will converge on this relatively small space, but as Tyler and Scout pointed out to me, there is 20 minutes of passing time between classes, and the daily schedule runs from 8am-10pm, so it is not likely that all 8,000 students will be walking there at once. 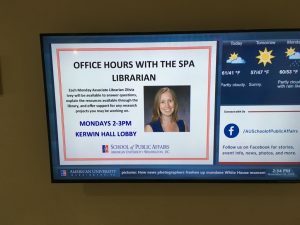 We were told in the info session that there are no classes on Wednesday, which provides some built-in time for students to do internships–apparently the average AU students does 3 internships during her college career. Though we were not taken into the library, it was pretty clear that it is a vital part of campus life. The library is open “24/5” and 9 am-9 pm on weekends. Scout mentioned that one of her first tasks this year was to write a research paper using all primary sources (which she had not had to do in high school) and that the librarians were very accessible. It seems that they even reach out to academic departments by having office hours in academic buildings, which is pretty cool. All first-year students participate in the “American University Experience” which prepares them for a “problem-based education” and, ultimately, for their senior capstone project. These classes are capped at 19 students and are taught by the students’ faculty advisors (who themselves have a load of no more than 76 advisees, which should make them more able to focus on individuals). There is also a 3:2 engineering degree program with Columbia University. All students follow a core curriculum, including at least one writing-intensive and one math-intensive class, but there are options for students focusing in any of the areas of study. We were told in the info session and by the tour guides that many students pursue double majors, or a major and a minor (perhaps facilitated by the generous Advanced Placement credit). Those are pretty impressive, and the high grades and test scores can explain American University’s overall 29% admissions rate. But during the presentation, we were told that admission rates during the Early Decision and Early Decision II rounds are 80%! That is a dramatic difference that tells me that motivated students who have good grades should seriously consider applying early to American. “We offer a limited number of students a waitlist decision each year. If space becomes available in the fall class and you sign up to remain on the waitlist, we will notify you in May if we’re able to offer you admission. But we do suggest that students deposit at another institution to secure a spot somewhere for the fall. That certainly sounds like good advice. I tend to think, however, that if I was an applicant who got waitlisted I would take solace in the idea of “a limited number” of waitlist decisions. But according to Common Dataset information, American “offered” 4,049 students a waitlist spot in 2017-18; that number is about 20% of total applicants, which is no solace at all! Not only did American University accept or waitlist 9,547 out of 18,699 applicants (51%) but only 609 of the people who were “offered” a place on the wait list “accepted” it (which means 85% of those waitlisted said, “no thank you”). This tells me that American must have trouble becoming their applicant’s first choice (which could be why nearly every ED applicant gets admitted); further, it tells me that students who have AU ranked high on their lists should do everything they can to visit before the middle of summer before senior year to see if they wants to apply Early Decision. 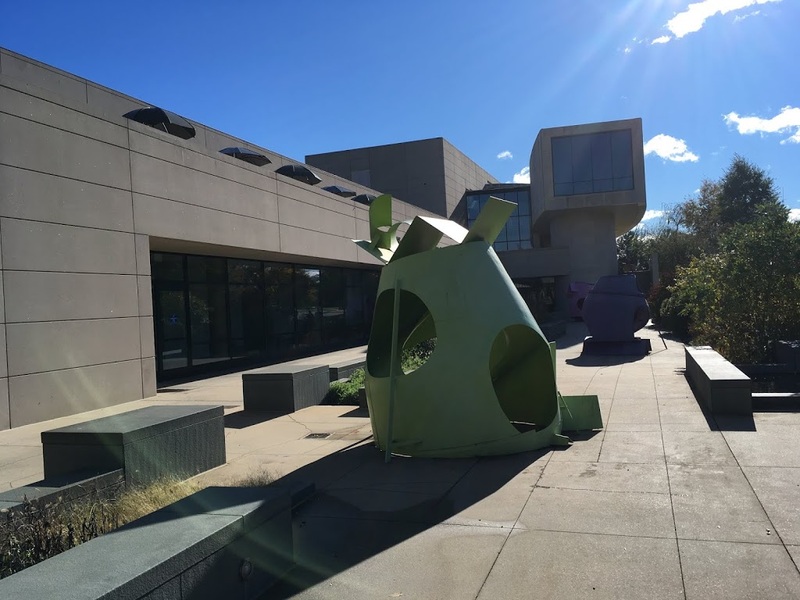 So–what did I think after revisiting American University? I still like it! I definitely need to replace my mental image of the school with an updated one of a bustling campus full of LEED certified new construction, but I continue to think that American could be the perfect urban college for a student who doesn’t want to live in the heart of a big city. During my day on campus I saw a fraternity organization (about 10% of students participate in Greek life) putting together a fun fair of sorts on the quad (there was music, volleyball, and people in big plastic bubbles knocking down giant bowling pins) that had about 100 people participating. I was also stopped by a former student of mine wearing an AU sweatshirt walking down the path who told me that she loves American and is majoring in the School of International Service. She was happy and healthy which I guess is the best advertisement for any university. 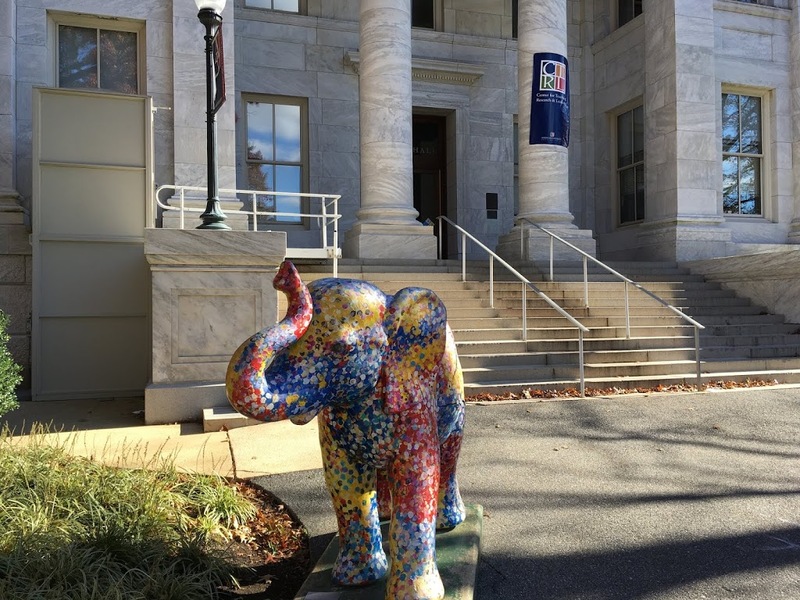 A student with good grades and test scores (or just good grades who doesn’t want to submit test scores) looking for a vibrant campus experience AND an urban location would do well to consider American University. I imagine that if the student is also interested in government, and wants to have a wide array of study abroad options that AU could be a contender for the top of their list. I'm surprised that they told you AU fills 100% of demonstrated need,, I specialize in helping families pay for college, and I have found AU not to be very generous at all. Collegeboard notes that they fill 91% of need, but when I asked a few years ago,, they said they also include PLUS loans (Parent loans, at an 8% interest rate), in that 91%. A PLUS loan is not financial aid. Be wary of the 'full need' statement. AU's Net Price Calculator is not helpful, they use the Federal Template, and the highest income bracket you can enter is "over $99K',, so someone with income of $101K, receives the same results as someone earning $2 million. Useless. That said,,, my son attended AU, he majored in audio technology, and is now an audio engineer at NPR and loving it. He did work at AU's NPR station for several years. I am very happy with AU, but not with their financial aid offers. They are working on it though.